The halter places control of your dog around his center of gravity rather than his head or neck. This method moves the training cues from the head and neck to the dog’s body. This utilizes a dog’s instinctive push/pull reflex called the opposition reflex — a dog’s natural inclination is to move toward pressure. This reflex is why so many dogs pull while on leash — as you pull, they pull back. 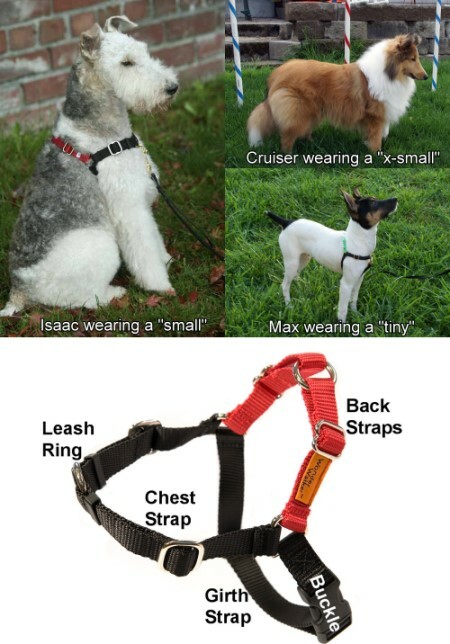 However, by attaching your leash to the chest ring, the pressure you apply is directed to the opposite side of their body by the girth strap. Your dog’s leash now allows you to persuasively guide your dog in the direction you want him to move. Unlike head halters, the Wonder Walker™ Body Halter© requires little or no acclimation time. Unlike choke collars, it does not cross the trachea so the airway cannot be compressed. Unlike prong collars which are designed to imitate another dog’s bite, it does not poke or provoke your dog so there is no potential for causing pain or injuring his skin. With minimal pressure, the Wonder Walker™ Body Halter© diminishes common pulling behaviors and helps eliminate jumping and lunging while on leash. Walking your dog becomes a pleasure rather than a chore. When used while training young dogs, pulling behavior may be eliminated from the beginning.